The Ottawa Senators are one of the worst teams in the NHL. Their best players, such as Daniel Alfredson, Jason Spezza and Sergei Gonchar are all well past their prime. Their youth hasn’t come into their own yet. And the only thing they really excel at is fighting; at the start of the night Ottawa boasted the top two in the league in penalty minutes. But that didn’t stop the Senators from coming into a packed house at Verizon Center, on a Saturday night, and giving the Washington Capitals more than they wanted, peppering Tomas Vokoun at every opportunity. Ultimately, the stellar first period the Washington Capital played was enough to carry the night, as the Caps eked out a 2-1 win over a game — but outmatched — Senators squad. The win leaves the Caps as the only team in the league with four wins without a loss. As was the case Thursday night, the Capitals relied heavily on goaltender Tomas Vokoun, who was once again up to the task. Vokoun stopped 33-of-34 shots and was often left to fend for himself. The Czech native was the best player on the ice for the Caps, bailing the team out on countless occasions. To a man in the locker room after the game, no one in the Caps’ locker room was satisfied with either the effort or performance, though everyone acknowledged the result: another two points in the standings. But it wasn’t pretty for the most part. The Caps jumped all over the Senators in the first period, taking a 2-0 lead early on goals by countrymen Marcus Johansson and Nicklas Backstrom. Backstrom scored first on the power play, taking a great backhanded pass from Alexander Semin and hitting a low-angle shot from close to the goal line. 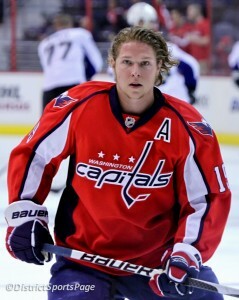 It was Backstrom’s first goal of the season, and first dating back to March of last season. Johansson took a drop pass from Mike Knuble at the blue line, charged down the boards, flew by defenseman Erik Karlsson, went behind the net, and realizing there wasn’t a passing lane, slipped it past goalie Alex Auld for the Caps’ first score. Last night, the Caps put in 20 minutes of good hockey, then hung on while Ottawa gave an honest, but ultimately short, effort in the final two frames. Call it a letdown from an emotional victory over Pittsburgh Thursday night. Call it playing down to the competition. Call it whatever you want. Right now, the Caps are calling it two points. It’s kinda funny. Reading the blogs and message boards and listening to the radio, you’d think the Caps were winless instead of undefeated. They’ve won four games without a loss, but the uneven and erratic play have fans, players and coaches all scratching their heads, wondering when the first complete game effort will surface. Those are the expectations this team has right now. It’s not enough to win each game they play, but they must win every period, every shift. And they must look dominant doing so, or risk the slings and arrows. These are the expectations the team and the organization has of itself as well. The road gets tougher very soon too. After a home game with the re-tooled Florida Panthers Tuesday night, the Caps will face the Philadelphia Flyers and Detroit Red Wings, then travel west to face the Edmonton Oilers and Vancouver Canucks, all in the space of 11 days. It will be tough to win those games playing one quality period per night. This is the just the third time in franchise history the Capitals have started the season winning their first four games. The last time was the 1997-98 season, which ended with a trip to the Stanley Cup Finals. D.J. King played his first game of the year. He logged 6:58 of ice time, recording one shot on goal and one hit.